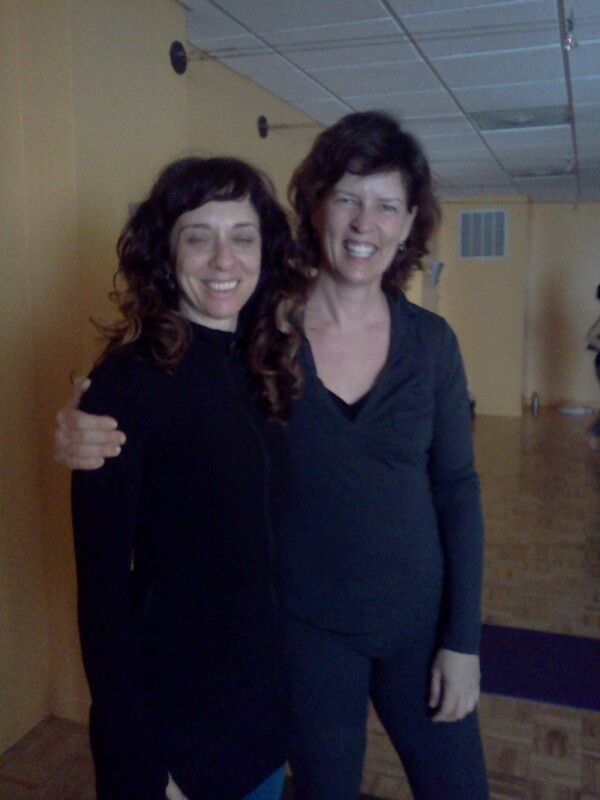 i was ready for a spiritual moment and that was what f2fb friend #93 dee dee chesley promised me: hot yoga at namiya. 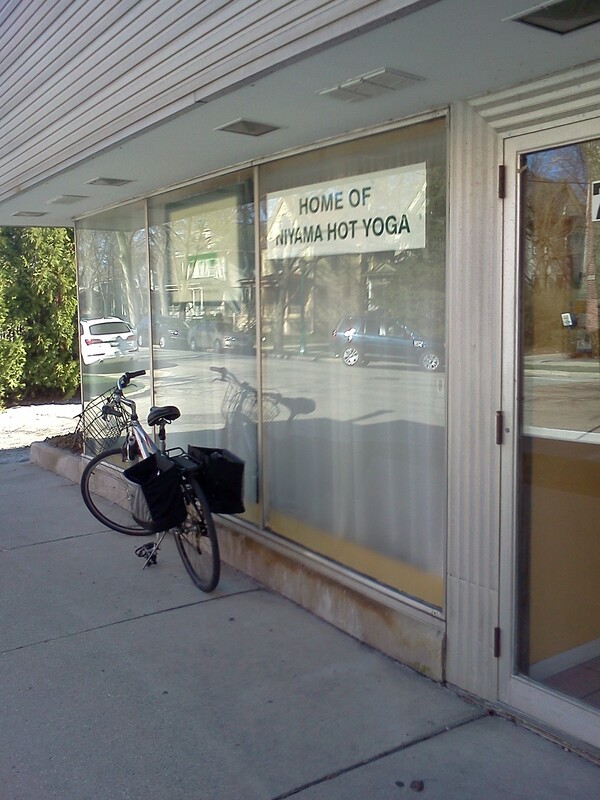 a mat, ninety degrees, a few “om’s” and maybe a “namaste” and i could get a nap in. what could possibly be more spiritual? i was going to be just like madonna or julia roberts. self-actualized, well rested, serene, and hot. instead the instructor dorrie guided us through an hour and a half game of twister. at one point, she asked us to do what she described as what would happen if a headstand and a handstand fell in love and had a baby. i had to move my mat away from everybody else because i kept falling over and women were quite rightly worried about their safety. and of course there was the show off yoga gal who was doing things that nature did not intend to be done with the human body. however, dee dee is very cool. i just need to learn photoshop so i can put my head on her body and then you’d think i was pretty damn talented. dee dee has two sons as i do and our paths have crossed a lot over the years. she is starting a new career in early childhood education. she is a cancer survivor and somebody who has learned how to start over. speaking of starting over, my father justin possibly regrets having put me up for adoption when i was three years old. but today, he called me to say that he’s considering moving in with me for a while as a way of starting our relationship over. this was a bit of a surprise to me–but he said that he wanted to get to know me and he felt like he never did that when he had the chance, that is twenty five years ago when i tracked him down with the help of a private detective. i’m not sure how i feel about this development since the last time i saw him was in the lobby of his apartment building when he was accusing me of being a “super conman” who had disabled his car and had brought f2fb #32 reggie gholston into his life. he claimed that reggie was not, in fact, a captain in the united states army but rather a male prostitute. so i decided to go out with diana tucker for a walk and a talk. she is one of my closest friends and it was an afterthought that she is also my facebook friend. i guess she’s number #94–we can talk about anything but she doesn’t like to have her picture taken. oddly, she also doesn’t like to have a fuss made over her birthday. i'[m still furious that winnetka doesn’t have a parade for my birthday. tallulah, on the other hand, is a bit of an attention seeker. unfortunately, i’m allergic to dogs and now have a blister on my mouth. if i don’t die of anaphylactic shock i’ll be seeing a very special friend who has a message for eastman’s birthday tomorrow. This entry was posted on Tuesday, April 12th, 2011 at 9:11 pm	and tagged with dee dee chesley, facebook, friendship, namiya, yoga and posted in Uncategorized. You can follow any responses to this entry through the RSS 2.0 feed. You had the perfect opportunity to do the Lucy Van Pelt, “Yuckkk! Dog germs, dog germs,” thing, and you didn’t take it. I’m rather shocked. ha ha! you are so fun!! i would have! i still have a blister. but i’m alive. diana is a wonderful friend who is just shy. no birthday parties, but she’s the one who planned the best surprise birthday party for me! no pictures, but she allowed her dog. . . sweetpea, i’m zooming into naperville for another round of friends. are you up for a pedicure party? please please say yes!